For obvious reasons, this particular story folds in very nicely with my approach to Tanzer and Bullington’s anthology, what with it singnaling a literary antecedent in its very title. But like a lot of Tennyson’s work, the poem holds an irresistible charm, and I don’t think it’s accidental that genre writers and genre fans in particular continue to latch onto his brand of grandiose aestheticism. Inflected as it is with the same Victorian mores and neuroses that continue to foment shows like Penny Dreadful, the finely sculpted drama of a lot of his work speaks to an archetypal space that – being Victorian and not, say, from Ancient Greece – also feels strangely close to our own world in its anxiety about ‘modernity’ and its desire to find pure, cloistered spaces where precious and beautiful things can flourish. Well, what Vaughn does is lift a giant, eldritch and bloody middle finger to all of that, and in ways that are entirely justified — and also, it must be said, all the more entertaining for it — she makes us feel ashamed for indulging in the kind of unreconstructed misogyny and jingoism that unfortunately forms the backbone of a lot of the work of the Victorian era. 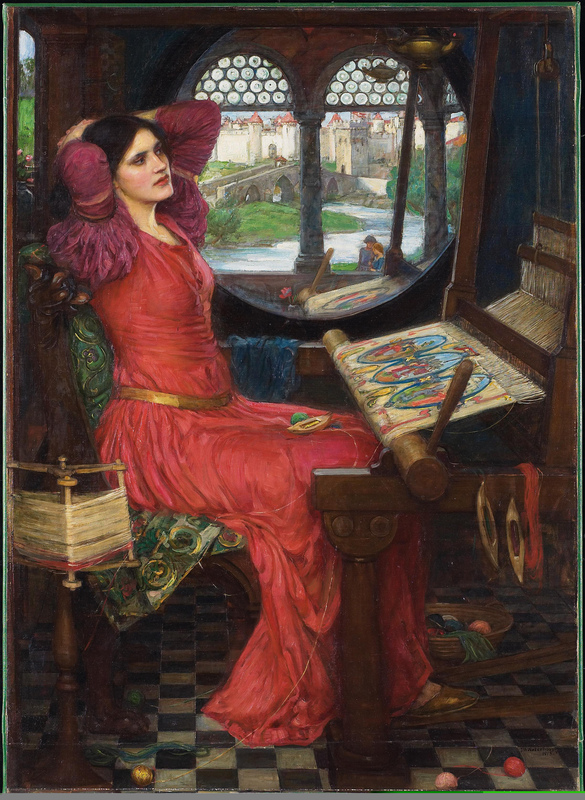 But first, she immerses us into the world of the doomed Lady of Shalott with a thorough care for the artificial universe she is encased in. Her enclosure is her curse, but there is a great dignity in her work too. She weaves her loom with the kind of dedication that any self-respecting artist would apply to their life’s work. This is a silent, private dignity that the vainglorious Lancelots of this world cannot begin to understand. As Vaughn moves to deliver the story to its conclusion, we dread the activation of the curse, but we also know it to be inevitable. Only… this time around, it won’t be just the Lady of Shalott that pays the price for Lancelot’s pursuit of spoils and glory. In a Lovecraftian universe, that’s about as comforting as things get. This entry was tagged alfred lord tennyson, carrie vaughn, HP Lovecraft, john william waterhouse, lady of shalott, swords v cthulhu. Bookmark the permalink.